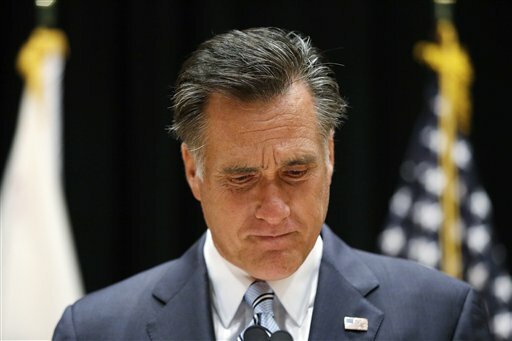 Mitt Romney stands by his comments on the 'secret video' in a press conference Monday night. Monday, while Mitt Romney was trying to smooth talk Latinos at the U.S. Hispanic Chamber of Commerce, his campaign released a new video celebrating October as Hispanic Heritage Month. The video features a laid back Mitt taking about Latino contributions to the U.S., with clips showing baseball great Roberto Clemente and salsa queen Celia Cruz among many others. It doesn’t address a single issue, doesn’t say one word about what Romney will do for Hispanics, and doesn’t tout a previous record with Latinos — which makes it quite similar to the chamber of commerce speech. During that speech Romney merely declared, “I am convinced that the Republican Party is the rightful home of Hispanic Americans.” Then, instead of Clemente and Cruz and the others from the video, he listed Republican Latino leaders, such as New Mexico Gov. Susana Martínez, Florida Sen. Marco Rubio and Texas Senate candidate Ted Cruz. No policy proposals, no record to talk about and the vaguest outline of intent on immigration. You might remember Romney’s Latino platform during the primaries: He said no to the DREAM Act, declared Arizona’s SB 1070 “a model” for the country and proposed solving immigration issues with "self-deportation," a proposal that amounts to making life here so hideous for Latinos that they go back to their countries of origin. But since he won his party’s nomination, Romney has barely talked about Latinos or mentioned what he&apos;ll do with the roughly 12 million undocumented workers in this country. At the Republican convention in Tampa, Romney avoided Latino issues — especially immigration policy — like the plague, a strategy supported by Hispanic Republicans such as former Florida Sen. Mel Martínez and Rep. Mario Díaz-Balart (perhaps unsurprisingly, both Cubans who don&apos;t think much beyond their Cuban-American base). Republican convention speakers all took their turns in the spotlight but no one actually talked Latino policy — least of all Latino GOPers like Susana Martínez, Rubio and Cruz, who spouted triumphalist patriotic narratives about immigrants and neglected to mention that their party’s platform actually uses the term “illegal alien" to discuss today’s undocumented and says they "pose great risk to the safety and sovereignty of the United States." Then Monday, while Romney was hanging out at the U.S. Hispanic Chamber of Commerce and his handlers were hanging their new feel good Latino video on YouTube, another video was released, a so-called "secret video" never meant to be aired. In it, Romney talks to a friendly audience at a private fundraiser about Obama’s supporters being deadbeats who don’t pay taxes, don’t take responsibility for themselves and depend on government assistance. Late Monday night, Romney held a press conference and stood by what he said. In the video, Romney didn’t talk about immigration, or education, or, frankly, the economy and unemployment and how it might effect Latinos either. But he did address Hispanics by saying this: "My dad, as you probably, know was the governor of Michigan and was the head of a car company. But he was born in Mexico... and, uh, had he been born of, uh, Mexican parents, I&apos;d have a better shot at winning this ... I mean I say that jokingly, but it would be helpful to be Latino."